Simms Dry Creek Boat Bag series comes in two sizes. The Medium size is the perfect way to keep your boat gear dry without cluttering up your boat. There's nothing more annoying than having your gear spread throughout your boat not knowing exactly where everything is. 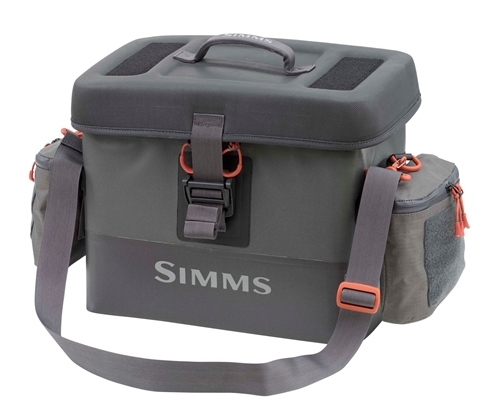 The Simms Dry Creek Boat Bag is the answer to all your problems. This waterproof boat bag will keep all your gear in place while keeping it dry and safe. No more soaking wet gear that you have to spread out at the end of the day to dry out. Plus, this new model Dry Creek Boat Bag has side pouches that you can remove and attach to a wading belt. How great is that!? You can turn your float trip in to a wading trip at the drop of a hat. Capacity: 27 L, 1619 cu. in. Dimensions: Bag: 14" x 8" x 12.5" Removable Pockets: 7.5" x 2 1/4" x 6.5"